Four Book Friday | Books to Inspire a Productive New Year — TBR, etc. I'm always up for an inspiring non-fiction book. I tend to trend toward memoir (Trevor Noah's Born a Crime was a favorite of mine last year), but recently books the books that have been catching my eye have been books about increasing productivity or wellness. I'm totally that person who buys into the fresh start new year stuff. In case you're that way too, I wanted to share four books that I think would help kick off a productive new year, no matter what your goals. I love books that use a bit of science to back up their points. Grit has an interesting origin story; Duckworth is the daughter of a scientist who frequently pointed out her lack of "genius". She grew up to become a psychologist and hypothesizes that success is not necessarily a byproduct of genius, but a particular combination of passion and persistence. Grit is applicable to any industry or life situation. She interviews people in various situations that require this grit and shares insights from her interviews of dozens of high achievers. Success isn't completely due to skill; it's a result of what a person does after they fall. I can't wait to read this! I got this for Christmas and can't believe I hadn't heard of Timothy Ferriss before this. He's an author, public speaker, and entrepreneur. The premise of this book is simple, but the execution is impressive. Ferriss came up with 10 questions to ask inspiring people and recruited some of the best mentors in the world to answer. Theres such a wide range of people in this book- chefs, authors, athletes, investors, artists, etc... the list goes on. I couldn't help but underline passages in this book- there's too much good stuff here. I'm planning on bringing in to work with me and reading a chapter a day on my lunch break. As an aside, the book is beautiful in person and would make a great gift. I won't lie- I literally know nothing about meditation but I added it to my list because I would like to be 10% happier. The science behind meditation caught my eye in this one- apparently, if you meditate enough, your brain rewires itself. For the better. 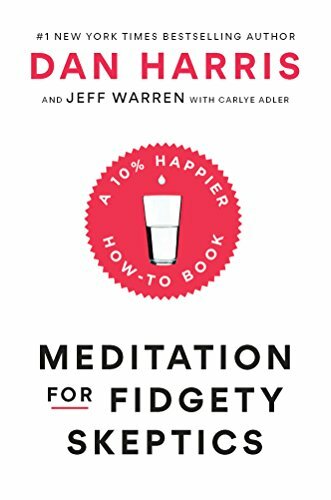 My favorite part about this is is that it isn't one man's opinion and expository essay about meditation- he and a friend go cross-country in a tour bus to survey people and find out what they think about meditation, if they think it would help them, and why they feel they don't have time to do it. I'm totally skeptical, but that the book acknowledges that people might be skeptical and seems to not be too serious has me intrigued. Finally, a book about being bored. A piece of me figured it would be an anti social media/live in the moment preach-y book, but then I started to think about the times that I feel my most creative. Typically, my most creative moments are those where I am forced to focus (such as when showering or driving) and when I'm not distracted. Like many, I consider multi-tasking a strength of mine and it's very hard for me to not be doing something. Turns out, there's something to letting yourself be bored and space out. Zomorodi advocates for allowing time to space out and discusses what happens when your mind wanders. My big plan for 2018 is to work smarter and not harder, and if spacing out for 10 minutes every hour will make things easier for me in the long run, I'm all for it. (Side eye to Gretchen Rubin, who's blurbed on both Bored and Brilliant and Meditation for Fidgety Skeptics). Are you a non-fiction/self-help fan? What books do you have your eye on this year?